← Pening, muntah, pengsan sebab terlalu lama depan komputer. P.S. – While you’re poring over these stats, don’t forget that Apple’s decided to slap a $100 price cut on the original iPads, making them eminently more desirable today than they were yesterday. Graphics PowerVR SGX 535 ? SAN FRANCISCO-March 2, 2011-Apple® today introduced iPad™ 2, the next generation of its magical device for browsing the web, reading and sending email, enjoying photos, watching videos, listening to music, playing games, reading ebooks and much more. 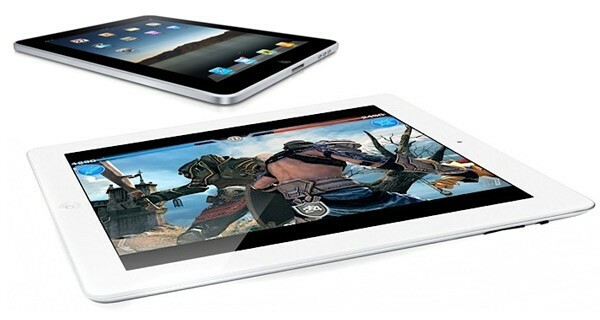 iPad 2 features an entirely new design that is 33 percent thinner and up to 15 percent lighter than the original iPad, while maintaining the same stunning 9.7-inch LED-backlit LCD screen. iPad 2 features Apple’s new dual-core A5 processor for blazing fast performance and stunning graphics and now includes two cameras, a front-facing VGA camera for FaceTime® and Photo Booth®, and a rear-facing camera that captures 720p HD video, bringing the innovative FaceTime feature to iPad users for the first time. Though it is thinner, lighter, faster and packed with new features, iPad 2 still delivers up to 10 hours of battery life* that users have come to expect. iPad 2 is available in black or white, features models that run on AT&T’s and Verizon’s 3G networks, and introduces the innovative iPad 2 Smart Cover in a range of vibrant polyurethane and rich leather colors. 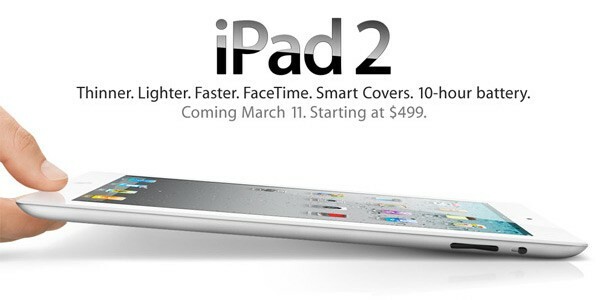 iPad 2 with Wi-Fi will be available on March 11 for a suggested retail price of $499 (US) for the 16GB model, $599 (US) for the 32GB model, $699 (US) for the 64GB model. iPad 2 Wi-Fi + 3G will be available for a suggested retail price of $629 (US) for the 16GB model, $729 (US) for the 32GB model and $829 (US) for the 64GB model. iPad 2 Wi-Fi + 3G compatible with the Verizon network will be available in the US only for a suggested retail price of $629 (US) for the 16GB model, $729 (US) for the 32GB model and $829 (US) for the 64GB model. iPad 2 will be sold in the US through the Apple Store® (www.apple.com), Apple’s retail stores and select Apple Authorized Resellers. iMovie and GarageBand for iPad apps will be available on March 11 for $4.99 each from the App Store on iPad or http://www.itunes.com/appstore. Apple has just made its second-generation iPad official! It features a 1GHz dual-core A5 chip and,finally, cameras, both on the front and rear. The new CPU is said to be up to twice as fast, with graphics performance up to nine times better than on the original iPad, while power requirements have been kept the same. Battery life is, consequently, unaltered, with Apple promising 10 hours. Pricing, too, has been left unchanged, starting at $499 for a 16GB WiFi-only iPad 2 and stretching up to $829 for a WiFi + 3G SKU with 64GB of storage. The new tablet will come with an HDMI output capable of 1080p — which will set you back $39 for the requisite dongle, called an Apple Digital AV Adapter — but there will sadly be no rumblings of Thunderbolt connectivity here. What you will get is an enlarged speaker grille on the back, as expected, and the same 1024 x 768 resolution and IPS LCD screen technology as on the original iPad. Update: We’ve gotten our first hands-on with the iPad 2 and, boy oh boy, it’s fast! You’ll find Apple’s official PR and some slick promo videos below, or you can keep your mouse clicking and check out our first hands-on with the iPad 2.